This is a very popular weekend walking/ Hiking destination for Your Hotel clients for hikers, picnickers, professional, amateur runners and worshippers. The hills can become quite busy over the weekends! Professional and amateur runners can be found in the morning jogging up and down the steep slopes. 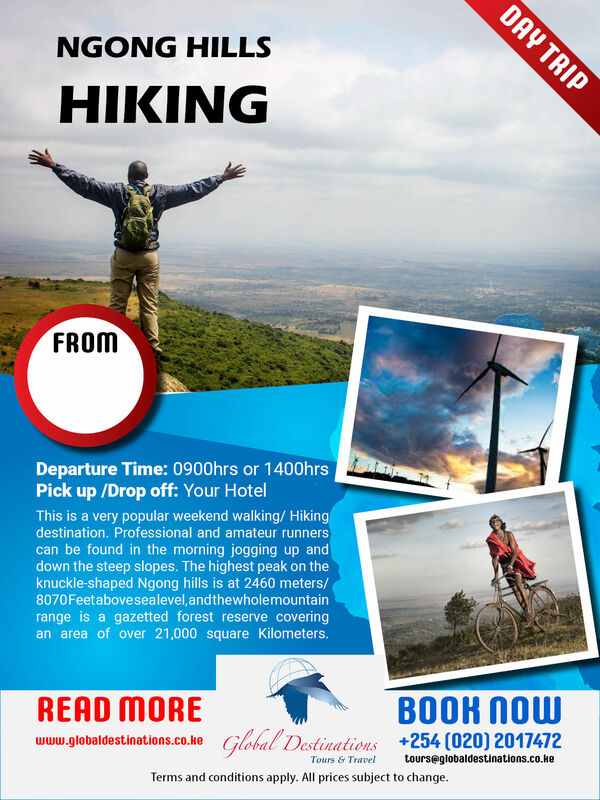 The highest peak on the knuckle-shaped Ngong hills is at 2460 meters/ 8070 Feet above sea level, and the whole mountain range is a gazetted forest reserve covering an area of over 21,000 square Kilometers. The Ngong Hills are where Denys Finch Hatton, Karen Blixen’s lover, is buried and your guide should be able to point to the exact location. The hills were a favorite place for Blixen and Finch Hatton to go hunting, especially for lions. The lions are gone now though, so it is safe to walk and enjoy the same beautiful scenery the couple enjoyed 100 years ago.